I realize I'm not "on Twitter," as they say, but the important stuff seems to find its way to the web. How have I missed that this is a thing? You can check out @DungeonsDonald here. Good stuff. Ha ha ha! Thanks for that. I don't really do "the Twitter" either (beyond auto-posting my HeroPress shizz). The question is: why did it take this long for this parody to appear? That's a great point! 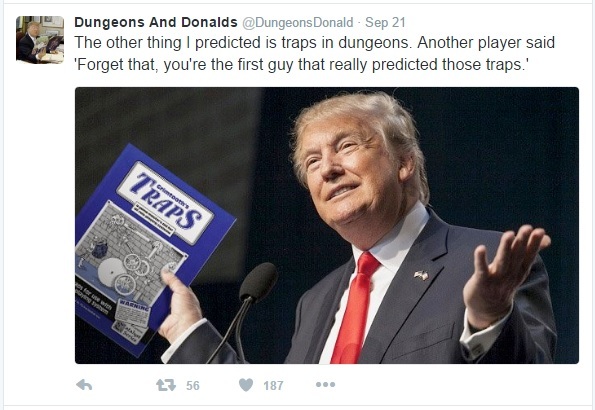 My guess is that May 6 was about the time that whoever runs the account hit critical mass on Trump impressions at their weekly D&D game. They've been very prolific since then, and it's mostly hilarious. The only thing not funny about it is that there's still a greater than trivial chance that Mr. Trump is going to be the next president of my country. Getting ready to watch tonight's debate.